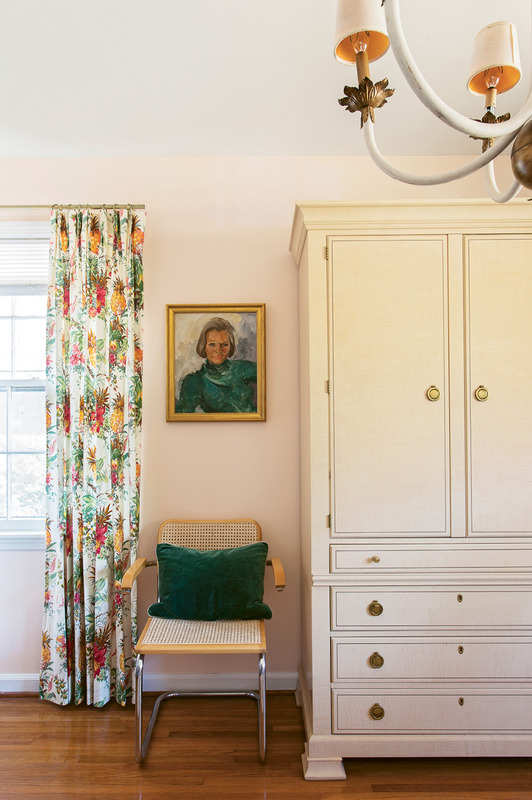 A streamlined layout, furnishings from a range of eras, and an eclectic art collection transform a bland mid-century brick ranch into a comfortably glamorous feminine retreat. 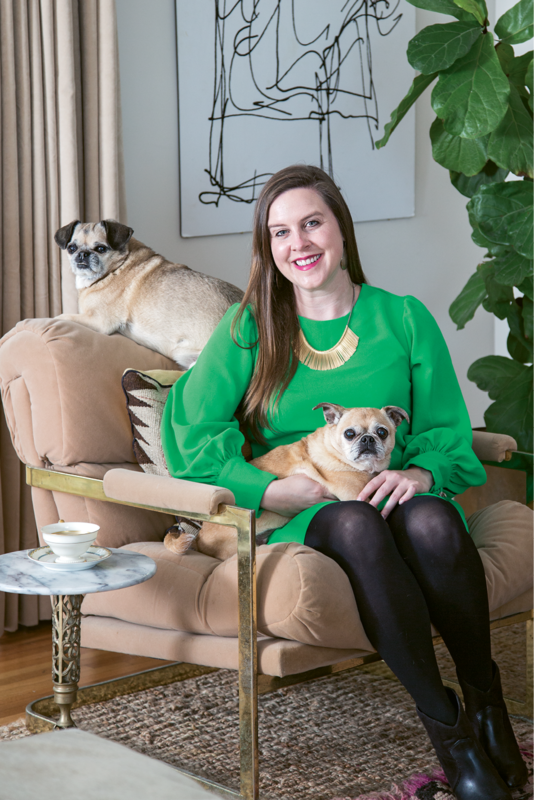 PERSONAL SPACE: When Charleston County Treasurer Mary Tinkler enlisted designer Erin Glennon to help overhaul her mid-century ranch, she wound up with a feminine retreat filled with meaningful pieces, including artwork collected over time and vintage furnishings that reflect her love of history. 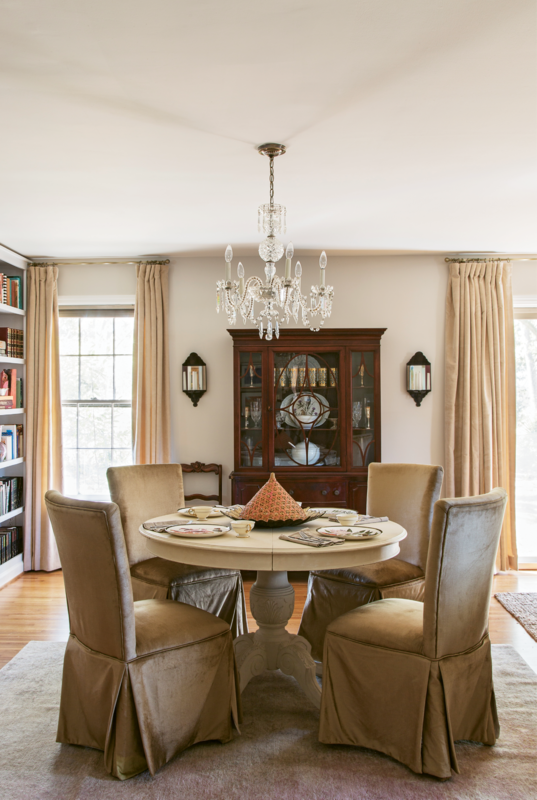 DINING IN STYLE: Velvety gold skirted dining chairs, a 1950s crystal chandelier, and mirrored sconces make the dining nook feel glamorous, while a handed-down hutch nods to tradition. 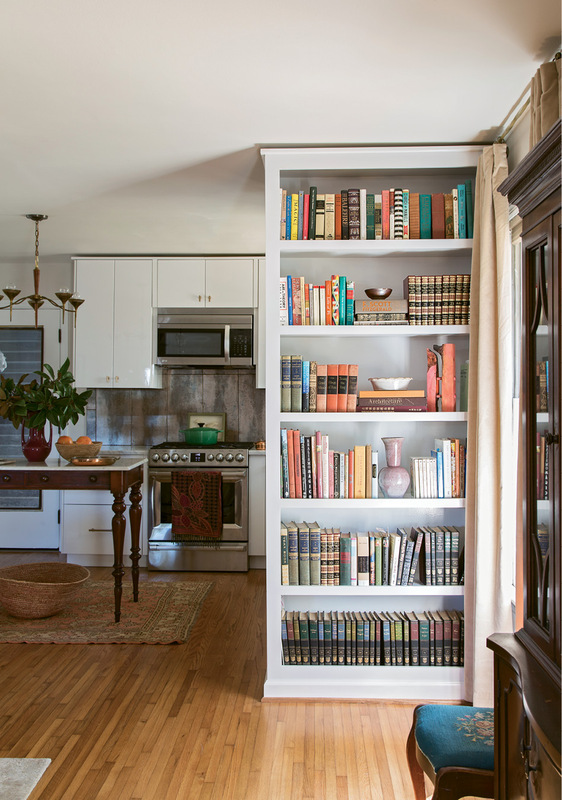 SHELF LIFE: To modernize the layout, Glennon advised taking down the wall separating the kitchen and dining nook. In its place, she added built-in bookshelves that keep the space visually open while still clearly defining individual rooms. FRESH TAKE: High-gloss cabinets and a cool coppery backsplash help modernize the retro kitchen. 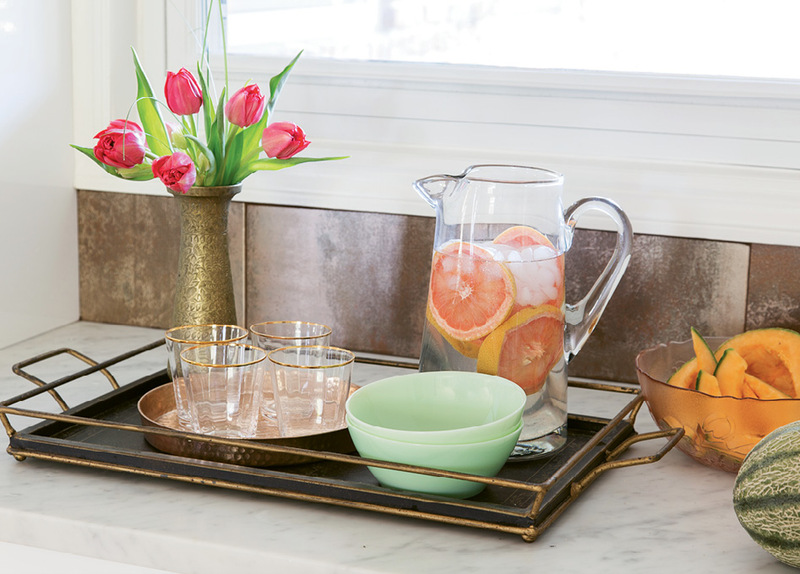 But antique pieces—such as a brass-and-wood mid-century light fixture and a marble-top table reimagined as an island—lend vintage charm that’s cohesive with the rest of the abode. Glennon found the Happy Floors “Oxido” porcelain tile in “Cobre” for the kitchen backsplash at Prosource. 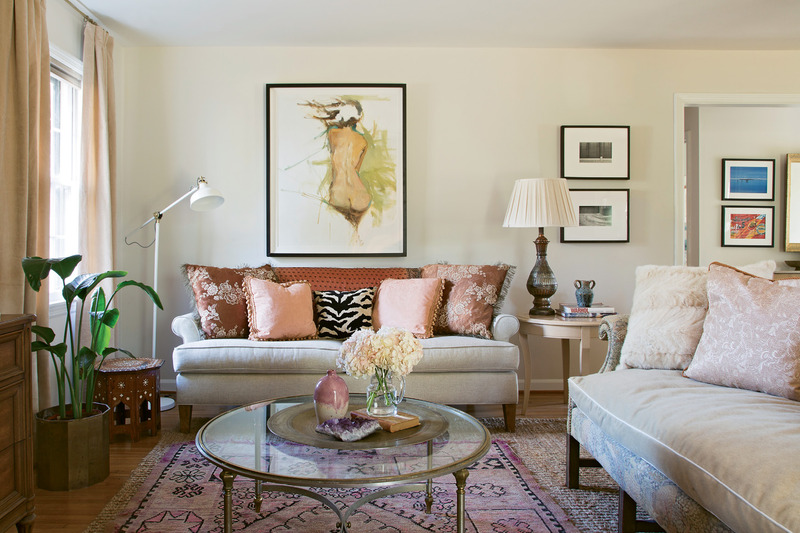 Lady’s Lounge: A vintage Italian settee and textiles in dusty pinks and creams—with a few pops of peacock blue—set a ladylike tone in Tinkler’s dressing room. On the wall, a large grouping of pressed botanicals in gilt frames adds a sense of dimension. 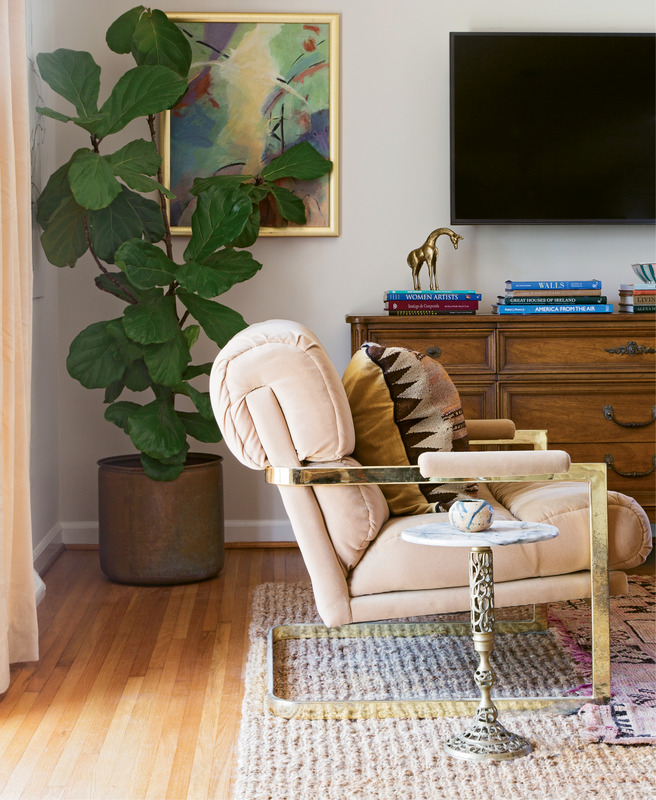 A fuzzy flokati rug and Moroccan brass tray reference the homeowner’s recent trip to the Mediterranean, where she fell for many of the region’s unique designs. 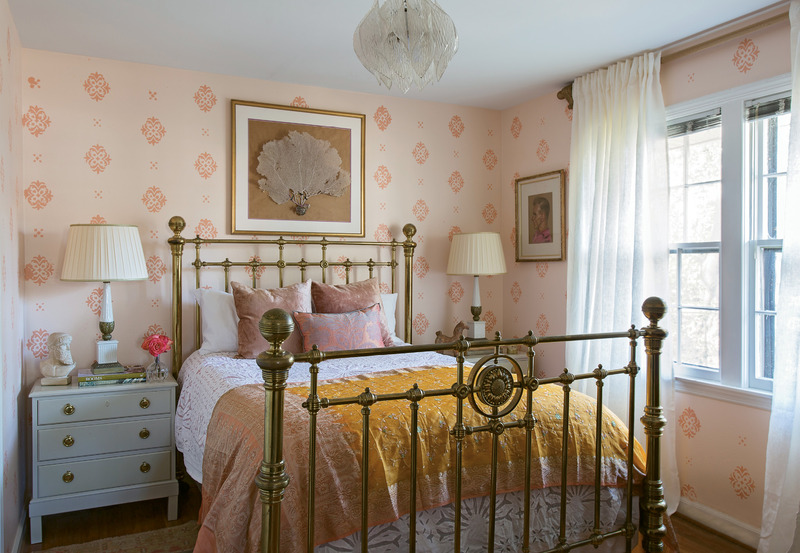 PRETTY IN PINK: In Tinkler’s bedroom, a pink-on-pink hand-stenciled motif is more affordable (but no less stunning) than wallpaper. Tall brass bedside lamps and a clear acrylic light fixture help the eight-foot ceilings seem higher. 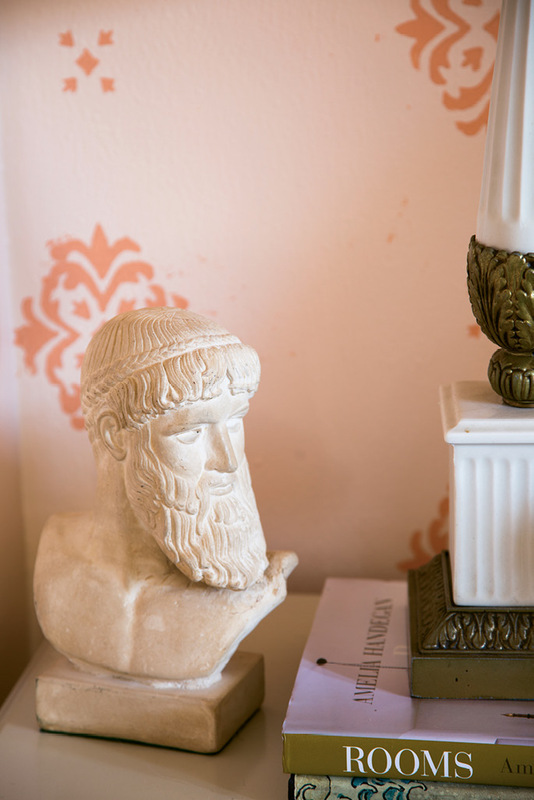 Glennon found the limestone bust of Poseidon while antiquing. 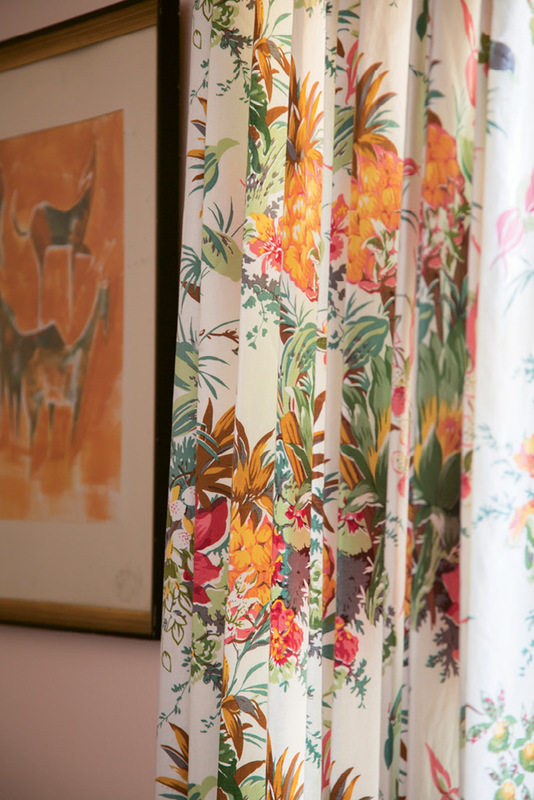 Floral drapes in punchy hues of orange, pink, and green add a beachy aesthetic to the home office. VINTAGE VIBE: In Tinkler’s home office, an antique Drexel armoire provides a handsome home for paperwork. Caned chairs, botanical textiles, and an antique portrait in a gilt frame lend a laid-back glamour to the work space. PHOTO: Mary Tinkler at home in West Ashley with her pups, Cornbread and Moose. In 2014, Mary Tinkler was craving a house that felt like home. Then a state legislator in the South Carolina House of Representatives, the Charleston native was splitting her time between rental homes here and in Columbia, and neither was particularly welcoming. Not that she had much time to spend relaxing: when she wasn’t penning policy for the people of Charleston and Dorchester counties, Tinkler had a side hustle, working locally as a realtor and property manager—all the while keeping her eyes peeled for a home to call her own. And so, when a certain 1960s brick ranch in West Ashley went up for sale, the market-savvy Tinkler put a contract together that day. The abode was a fixer-upper, but the location was a perfect fit—within District 114, which she then represented at the state level. What’s more, it was within walking distance of her brother’s and parents’ Old Charles Towne places. (She’s particularly close with her father, former city councilman and downtown attorney Paul Tinkler.) After stints in D.C. and Alabama, she returned to Charleston in 2011 and began managing her dad’s senate race, which wound up launching her own political career. “This is the community I grew up in, and home has a way of drawing you in,” she says. Though the 1,300-square-foot structure needed work, Tinkler saw potential in the warm hardwood floors and spacious fenced-in backyard, the latter being the perfect spot for her pups, Moose and Cornbread, to romp and play. “The rooms were boxy, almost maze-like, but I was drawn to what could be a large living space between the kitchen, dining, and living rooms,” she adds. For the next year and half, though, that potential remained untapped, as Tinkler continued to commute to Columbia for her gig as a state rep while simultaneously launching a campaign for Charleston County Treasurer. That campaign became her chief focus, and the results were historic: in 2016, Tinkler became the first female treasurer ever elected in Charleston County. After long days on the campaign trail, Tinkler didn’t have energy for decorating. “It just didn’t feel like home; spaces were underutilized, there was a lack of furnishings, and the lighting wasn’t right,” Tinkler says. “I love to entertain, but I never wanted to have people over.” The busy Tinkler recognized that it was time to bring in a pro and enlisted pal and area designer Erin Glennon to lead the charge on a reno that would respect the home’s mid-century roots, modernize the layout, and add a dose of vintage glamour. Next up, she set about gutting the dated kitchen. Tinkler originally wanted simple Shaker-style cabinets, but to achieve a more glamorous look, Glennon steered her towards cupboards with more modern lines, brass hardware, and a high-gloss white finish. “That led us to the ceramic-copper backsplash, which drove some of the fabric and furniture choices—like the velvety gold dining chairs,” Glennon explains. 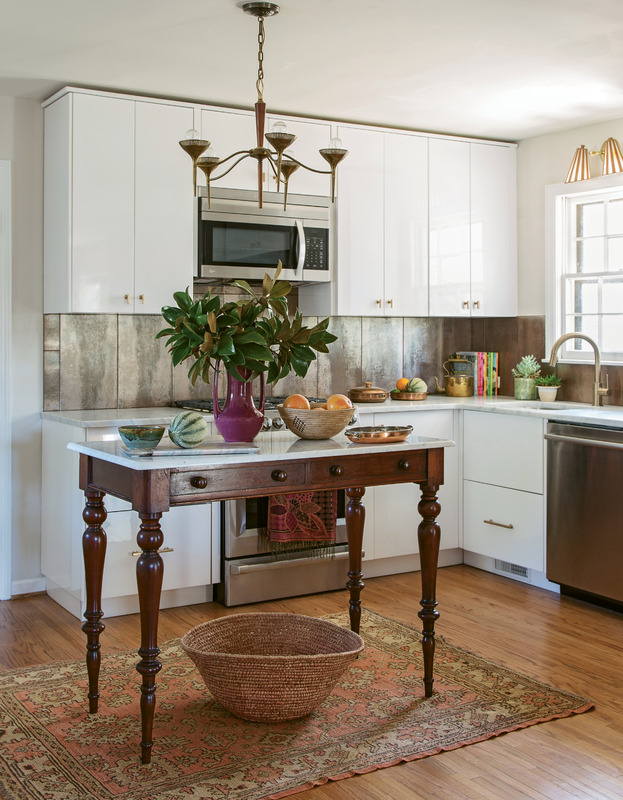 A found antique table with Federal-style legs and a marble top was reimagined as a kitchen island, while a mid-century light fixture with brass-and-wood accents nods to the home’s history. Finally, Glennon layered in art, much of which had already been collected by Tinkler over time. Before entering the political arena, she studied art history, interned at the Gibbes and the Brooks Museum in Memphis, and worked at the Corcoran Gallery of Art in D.C. “Many of these works are special to me because I know the artists,” Tinkler says. “Some are imperfect; one piece, made by students of the Corcoran College of Art + Design, was messed up in the printing process. The image is overexposed, but I love how that shows the process of things.” A pair of gold and green abstracts that flank the TV in the living room were picked up by Tinkler’s mom at an area garage sale. “My mom has an incredible eye for art,” she notes. Other works, such as photographs by Tripp Smith and a sweetgrass basket by Mary Jackson, celebrate the Lowcountry Tinkler so loves. 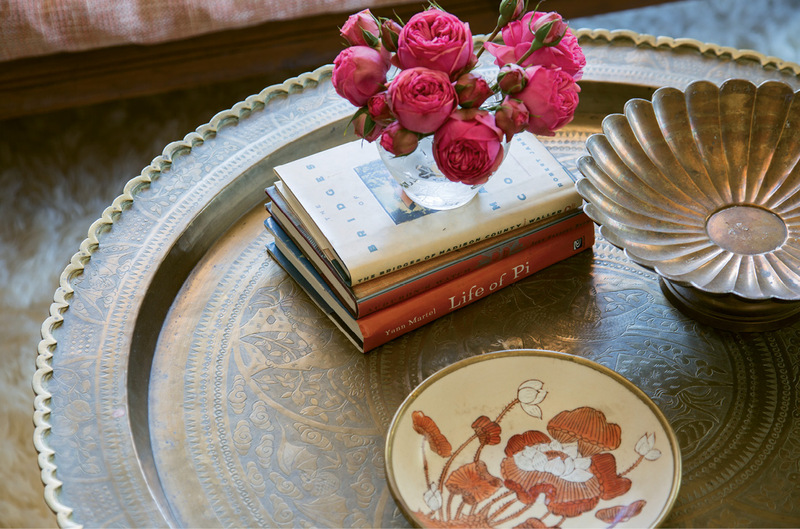 All told, Glennon created a look that’s feminine and eclectic, blending vintage and modern in a way that perfectly suited Tinkler’s varied interests. “I love travel, food, taxes, art, finance; Erin found a way to pull it all together,” she notes.